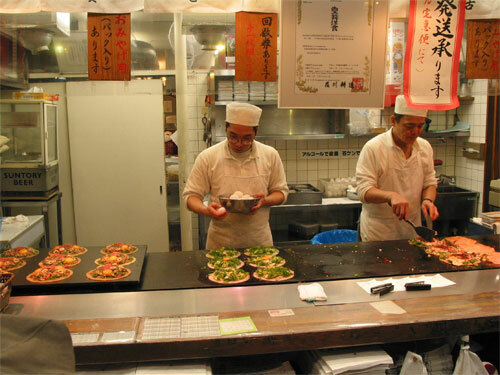 You know that a have a japonophiliac streak in me, but I can’t honestly say that Japanese cuisine is my favorite. In fact it holds a shaky fourth position, after Vietnamese, Korean and Thai cuisines (in that order). Sushi, sashimi and kushiyaki (stuff on skewers) are great comfort food, and not many things achive the perfection of high quality sashimi (especially if I caught the fish) and fried smelt is probably one of my top 10 favorite foods. 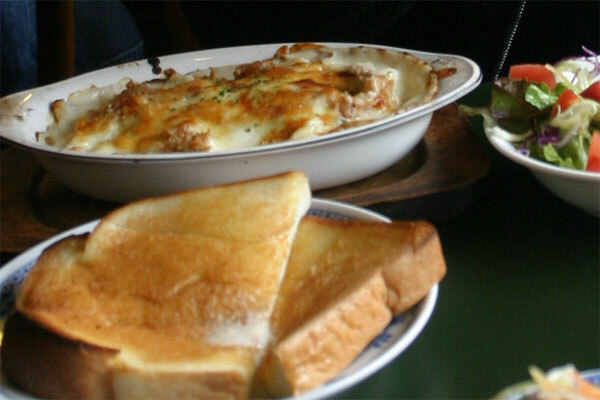 But overall, I think Japanese cuisine is all that great, but I still like it better than French and Italian. Let’s start at the base of Japanese food pyramid. The fast food. I am not going to get into details about Japanese McDonalds and the like. Calling it Macdonurado and making the clown hot and female does not change it much. Let’s start with the first meal that you might encounter – the bento, the boxed lunch. The sell these in most trains and train stations. The variety of bento is amazing, almost always reflecting the season and featuring fresh local produce. It’s probably the perfect and the best fast food in the world. Sadly, obentos are not popular in the US, which I think might change in the future. The thing that most resembles the bento, the tv dinner, is terrible and thankfully extinct. 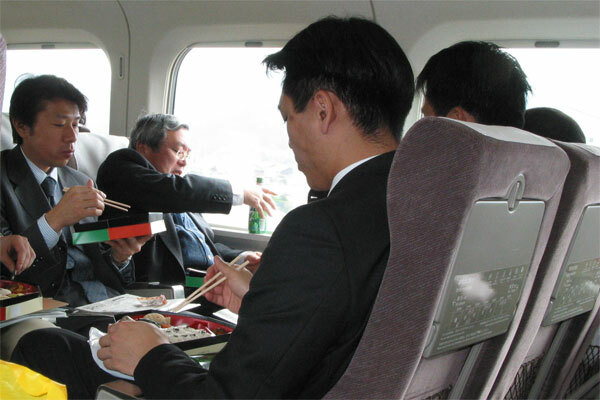 Here’s a group of Japanese businessmen enjoying their bentos in a shinkansen. One of my favorite features of Mainichi Daily News is a special feature about bentos written by Shinobu Kobayashi. A bento usually cost about $10. 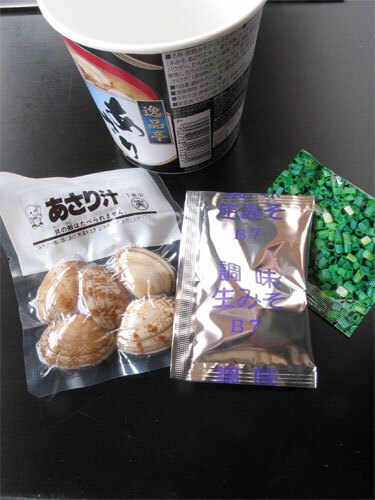 My favorite part of bentos is the little exotic pickles, from lotus root to stuff I can’t even identify. They are like a little surprise – you never know how they’ll taste. A whole separate category should be devoted to festival junk food. Think the Japanese version of American county fair food. First, there’s takoyaki, which should be familiar to all I Love Katamari players. 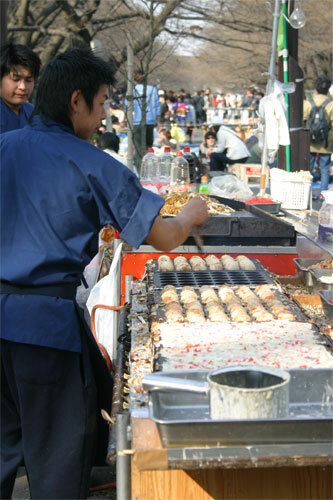 Takoyaki are greasy balls of fried batter, filled with chunks of octopus and drenched in mayo, served searing hot. Unhealthy as hell, but great with beer. 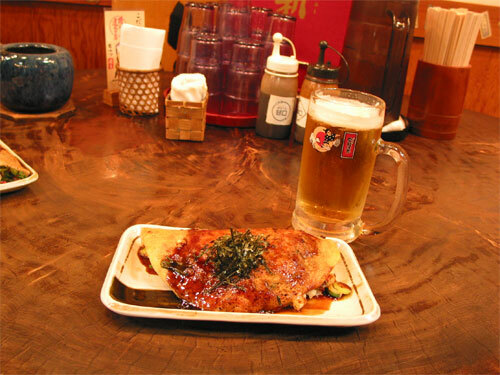 Okonomiyaki is sort of Japanese take on pizza. They are also hot and greasy beyond belief, and again, a great drinking food. 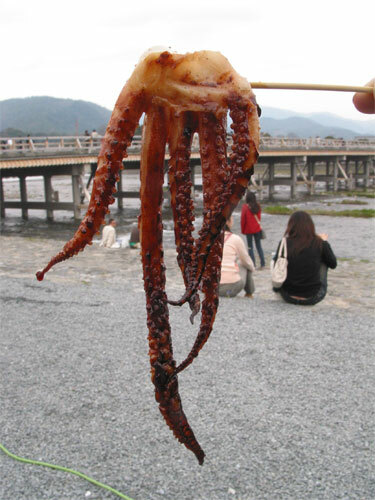 Grilled squid on a stick is a popular festival food. 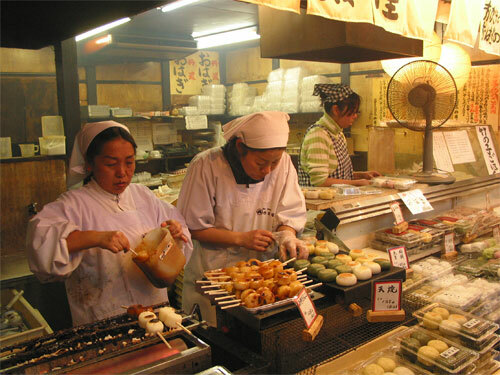 Mitarashi dango are sticky rice flour dumplings on a stick. They are very filling, but not particularly tasty. I liked mochi a bit more. Fried foods are very popular in Japan, and the idea of deep frying was introduced by Portuguese missionaries. I always thought that it were the Dutch and the word “tempura” refered to “temperature,” but Wikipedia article tells me that it’s from “”ad tempora quadragesimae”, meaning “in the time of Lent””. In any case, tempura is only good when it’s made in front of you, and even then too greasy for my taste. I had a good tempura meal in a moderately expensive tempura place (it set me back something like $50) and I am still underwhelmed. Tempura here in New York is outright horrible. While junk food overlows and is dirt cheap, fruit and vegetables generally are very expensive. To make up for enormous prices, they are often local, hand picked, meticulously packaged (sometimes with an autographed photo of the farmer), and of great quality. 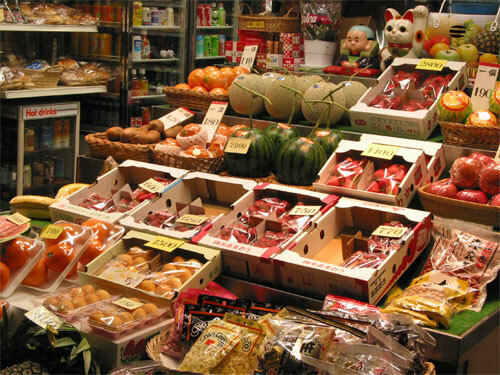 Here’s a moderately cheap grocery store – those tiny little watermelons are $20 each. For all the corruption of the west, traditional meals are great. 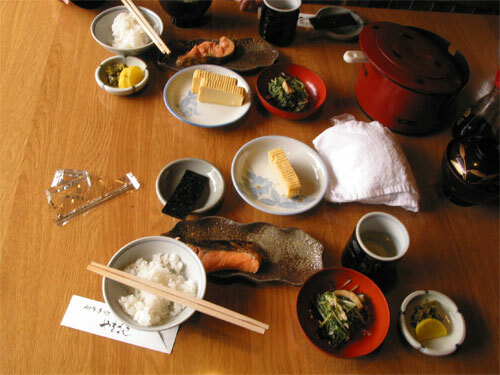 I already covered the phenomenon of the “morning set” in a previous post, so here’s a photo of a traditional Japanese breakfast that I had in a ryokan. It consted of fried salmon, rice, miso soup, seeweed salad, pickles and interestingly shaped egg omlet. 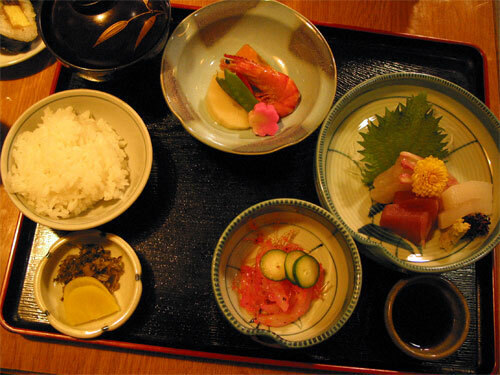 Traditional dinner at ryokan was also great – sashimi, two kinds of seafood salad, pickled shrimp, miso soup, rice and sake. The little pink flower-like thingy is a slice of a special boiled fish cake (I think).